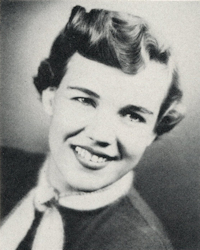 Obituary – Kever, Elsie “Ann” (Abbott) « Perry High School Alumni Association, Inc.
﻿Basketball Queen 54-55, Student Council President 54-55, Girls State 54, Student Council 51-53, Annual Staff 53-55, Perry-scope Staff 54-55, Annual Play 53-55, Junior Play 53-54, Jr. Rotarian 54-55, BP&W Senior Girl 54-55, Basketball Queen Attendant 52-53, Football Queen Manager 52-53, 53-54, 54-55, Band Queen Manager 51-52, Band 51-55, Home Room President 53-54, Home Room Secretary 54-55, Office Staff 52-53, 51-52, Freshman Assembly 51-52. Mrs. William Kever, the former Ann Abbott of Perry, died unexpectedly in her sleep Sunday night at her home at Woodland Hills, Calif. Funeral will be at Pierce Brothers Mortuary, 6153 Van Nuys Blvd., Van Nuys, Calif., Thursday morning. Mrs. Kever was the foster daughter of Mrs. Elmer Lewellen, 1208 East Rainbow drive, and the late Faye Thompson. She worked as a ticket agent for Delta Airlines for 20 years and retired about eight months ago. She graduated from Perry high school in 1955. She and William J. Kever were married on September 21, 1973 in Los Angeles, California. Besides Mrs. Lewellen, she is survived by her husband of the home; two sons, Bret William, 7 years, and Kent Joseph, 14 months and two foster sisters, Mrs. Mary Helen Schrieber of Van Nuys, and Mrs. Leora Eppler, Tulsa.